Minister of Industry, Commerce, Agriculture and Fisheries, Hon. Karl Samuda, addresses sugar stakeholders at the Long Pond Sugar Factory in Clark’s Town, Trelawny during a tour of the facility on Friday (July 8). Minister of Industry, Commerce, Agriculture and Fisheries, Hon. Karl Samuda, says strategies employed by the Government at the Monymusk Sugar Factory in Clarendon will ensure that the facility remains open when the current sugar crop ends. Sugar Company of Jamaica (SCJ) Holdings is operating the Monymusk factory free of rental in order to mill the over 150,000 tonnes of cane expected to be reaped for the crop period. SCJ Holdings will also manage 2,800 hectares of cane up to the end of the 2016 crop period, and has invited farmers to lease lands for one year. Speaking during a tour of the Long Pond Sugar Factory in Clark’s Town, Trelawny on Friday (July 8), Minister Samuda said operational issues affecting the cane fields have been addressed. 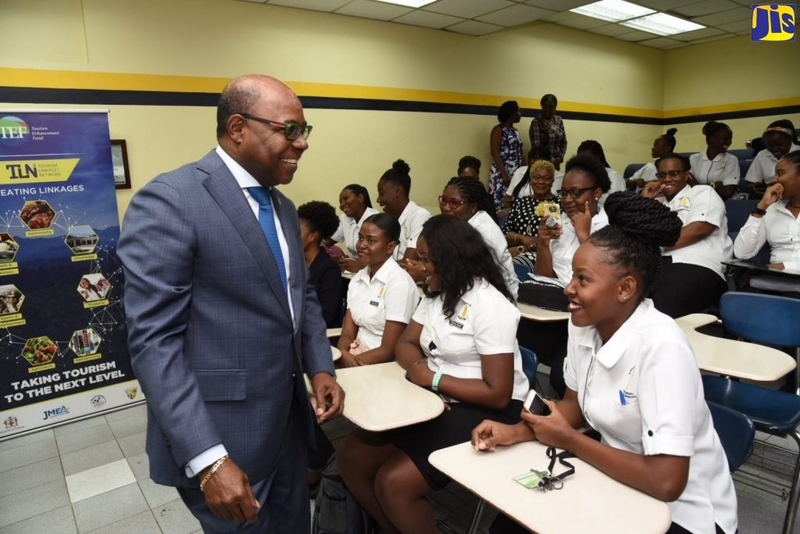 “At another time I will visit Monymusk and explain the strategy we employed to make sure that Monymusk does not close and also to guarantee that you will have water through the irrigation system ( a lack of which) has paralysed the cane fields,” he said. Sugar Company of Jamaica (SCJ) Holdings is operating the Monymusk factory free of rental in order to mill the over 150,000 tonnes of cane expected to be reaped for the crop period. This is under an agreement between the Government and Pan Caribbean Sugar Company, the principals of Monymusk. The programme of assistance by the Government is aimed at securing the future of the industry, which has been affected by issues such as marketing arrangements, inadequate prices for exports, as well as financial challenges among factory owners. Between 2009 and 2010, the Government divested its holdings in Monymusk, Frome, Bernard Lodge, Trelawny and St. Thomas Estates, which constitute 70 per cent of the sugar industry.